Sitting on the front porch and noticed 2 bright lights in the sky to the south. They hovered and changed directions going back and forth. Then they would change from green to red and drop like a rock behind the treeline. This was about 2 weeks before I made this report. I was told they may have been Helios helicopters. I didnt notice them again until last night, they were in the same location and doing the same thing as before, changing color and dropping out of sight and back up again. Tonight they appeared at the same time around 9:15pm. I drove to a better location to observe them and a couple of more people were watching them. A lady said that it flew right over them just before I arrived and was in the shape of an asterisk with a spinning motion in the center, she said it made a slight humming noise like an air conditioning unit. We watched the lights hover, float around make hairpin turns and come to a complete stop. One of the objects changed colors from a green and white light to a brilliant red and dropped like a rock behind the treeline. The other one remained in the air and floated around then stop and hover. A few minutes passed and the object that dropped behind the treeline reappeared rising back up in a brilliant red light..then the object went from red to a blinding white light. We watched the objects and we had a really freaky feeling watching them. 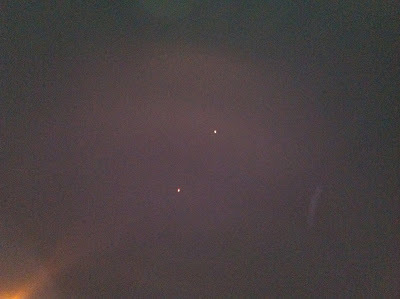 then both objects turned red and dropped behind the treeline and we didnt see them again. The other couple said they came to the same location last night and watched the same thing, they appear at the same time at night and the event last a good 45 minutes. They said that when they both dropped behind the trees you dont see them again. Not sure if they are landing but the one goes down while the other stays up and hovers and floats nearby. Both objects dropped below the tree line. we stayed around but didnt see the objects again. If a Mufon investigator can contact me I will send him directions..i have a feeling they will be back again tomorrow evening. Cast you mind back to one of the most widely talked about UFO sightings of 2008 - the Stephenville, Texas sighting. The sighting was seen by many over multiple days and drew mass media attention. It took, the FAA five weeks after the FOIA requests were sent out after January 16 to release Radar data to Mufon. Many assume this delay was due to the vacinity of Bush's Crawford Ranch to the sighting. Now a new program has been used using this data to show what the skies looked like around Stephenville, Texas, on January 8, 2008.Rob Jeffs has bundled the 2.8 million radar returns MUFON acquired from five FAA and National Weather Service sites, and recreated moving images of the air traffic over central Texas from 4-8 p.m. on Jan. 8, 2008. Applying a radar video of that evening and a superimposed a map under the radar animation, annotations were added to show witness locations and the unknown tracks on radar. This make the video a handy tool to allow us to see the path taken by the UFO during that night. The radar analysis and information shown is from "Stephenville Lights: A Comprehensive Radar and Witness Report Study" by Glen Schulze and Robert Powell. Strange UFO lights over Massapequa Park, New York. If anyone else saw these lights in the vicinity please respond to this post. If anyone else witnessed this sighting please reply to this post. Strange lights over Watsonville in California August 6th 2013. The video poster woul like to hear from others as a reply to this post or vieo if others witnessed this strange light show. This video comes in from Watsonville in California. You may have heard of us if you know where most of the worlds strawberries come from. On August 6th 2013 we had a mass sighting that the news disregarded as a local celebration. A local celebration does not cause temporary power outages. A series of UFO videos of some strange hovering orbs over lake Michigan August 2013. Filmed August 2013. If you have also seen UFOs in this area please let us know and respond to this post. Note if they were simply lights from boats in then the lights would not appear above the moon in the horizon. Popocatépetl seems to be a never ending area of UFO activity. We have posted numerous UFO videos from the area with activity over the last year being the most active. The area is a no fly zone for all aircraft. Filmers comments: This interesting UFO ( ovnis ) sighting of a large spherical object in the distance that was filmed and was near the volcanoes of Puebla. You could say it was near the Popocatepetl volcano as the filming is hard to see the volcano crater illuminated by the night vision system that is applied after filming the object in the normal system near the volcano and then fades on three occasions, is an area of ​​great considering the distance that we encontravamos the time of filming, is a large area that was under the clouds appearing and disappearing, we had a spectacular view of the object and of Popocatepetl , is an excellent film of an object nearby and vanishing at the time of filming for three times. A group of UFO's appear over Galion Ohio U.S on the 12th August 2013. The objects start of with 1 then it is joined by a few, they appear to be flying in an intelligent manner and they are a fiery red in colour. At first the recorder-winess sees an on coming helicopter which seems to intercept one of the strange lights. We would like to hear from any other in Ohio who may have also seen these lights. 3 and a fourth orange ball above our heads Saturday, August 10 at 22:58, no more than 3000 m of altitude, in stationary mode and quietly!! Amazing!! The National Security Archive website released a document on August 15 titled The Central Intelligence Agency and Overhead Reconnaissance: The U-2 and OXCART Programs, 1954-1974 by agency historians Gregory Pedlow and Donald Welzenbach. Area 51 has been formally acknowledged by the government. All the major news networks have broke the story and televisions shows like "X-Files" and movies like "Independence Day" both helped catapult Area 51 into the public consciousness. Both stories followed UFOlogists' theories about the base. Finally the government has acknowledged the existence of the secret base, but it has nothing to do with extraterrestrials or flying saucers. A heavily edited version of this document was previously published in classified channels in 1992 and 1998. This less edited version was released in response to freedom of information act requests made in 2005 for a mandatory declassification. This release is notable for the significant amount of newly declassified material with respect to the U-2.